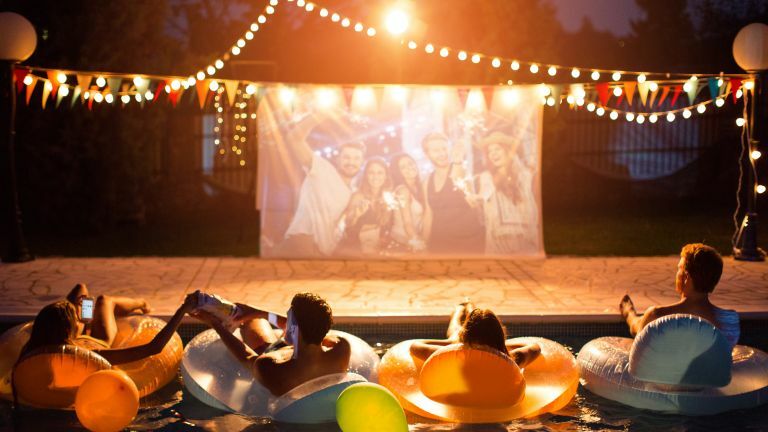 Perfect for when the warm summer evenings finally arrive, outdoor projectors are just what you need for a film night in the garden. Simply add some of your favourite people, plenty of cosy blankets and a tipple (or two) of your choice and that's summer evenings prepared. For more smart home tech, check out our hub page. Looking for more advice, ideas and inspiration to prepare your garden for summer? You'll find everything you need (and more) over on our gardens hub page. For a projector to provide a quality image outside, 2,000 lumens is the lowest you can go in terms of brightness. Outdoor projectors should also playback in at least HD resolution to ensure the picture is of reasonable quality. The Optoma UHD60 earns our top spot thanks to its incredible 3,000 lumens output, super high quality 4K resolution and massive contrast ratio. Aside from those fairly important tech specs, consider whether you’ll need to purchase a screen or whether the side of the house or your garage door will do. Consider the source of your film – will you need to bring a laptop or games console outside? Or is the projector compatible with a smart dongle? Some good outdoor speakers will also always help. Browse our pick of the best outdoor speakers to connect with your projector. If you want the best, you’re going to have to be prepared to pay the price. However, for your money, you receive stunning 4K quality, incredible colour contrasting and stereo sound. Arguably, this is the kind of stereo you buy for your cinema room (it’s hard to justify the outlay otherwise), but when you want to benefit from the full 4K quality of your Blu-ray DVDs outside, this is the kind of money you’re going to have to spend. When it comes to watching films outside, the brighter the lumens the better. It means there’s a greater contrast against any background light, which should mean a higher quality image. While it may not boast HD resolution, this projector has a pretty impressive contrast ratio, too, so there should be no compromise made to your favourite movie scenes. If you’re looking for an affordable, portable projector for the occasional film in the garden, then this Epson pretty much ticks all the boxes. So long as you’re prepared to exchange 4K resolution for HD, this ViewSonic projector is a great buy. In addition to a high contrast ratio, the projector boasts SuperColour technology, HDMI ports for Blu-ray hook up and a USB port for a wireless dongle. Featuring SonicExpert sound technology, the projector features an enlarged speaker chamber and a powerful amplifier for immersive sound, which means no additional cost on speakers. Movie lovers, football fans and gamers will love this projector. With a fast response time (great for action films and action-heavy games), a massive 3,200 lumens and an excellent contrast ratio, you can expect to experience a great picture whether you’re inside or out, and 3D fans are catered for, too. This projector isn’t without its compromises, though. Although HD, the picture won’t be the full 1,920 x 1,080 resolution, and the speakers only emit 2W worth of sound, so portable speakers are necessary. What better way to experience your 3D films in full HD than on the big screen outside on a warm summer’s evening? Calibrated for cinematic colour, this projector is perfect for watching films, and with 3D compatibility you can even watch your favourite characters pop out in your garden, too. The projector comes with powerful 20W speakers installed, with the BenQ Audio Enhancer ensuring a good bass and stereo sound. With both HDMI and USB imports, this projector is great for Blu-rays and smart sticks.